Do women empowerment workshops work? 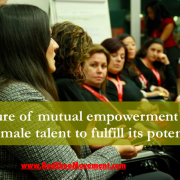 You are here: Home / Red Shoe Movement Blog / Human Resources Management / Do women empowerment workshops work? Women empowerment workshops are spreading throughout the world. The question is, do they have the intended effect? Discover this unique methodology that does work! I don’t remember the first time I heard the question, “What is women empowerment?” but it was in connection with women empowerment workshops. I do remember thinking that it must have something to do with improving self-esteem. What else could it be? If you have to empower women it must mean they feel disempowered, right? 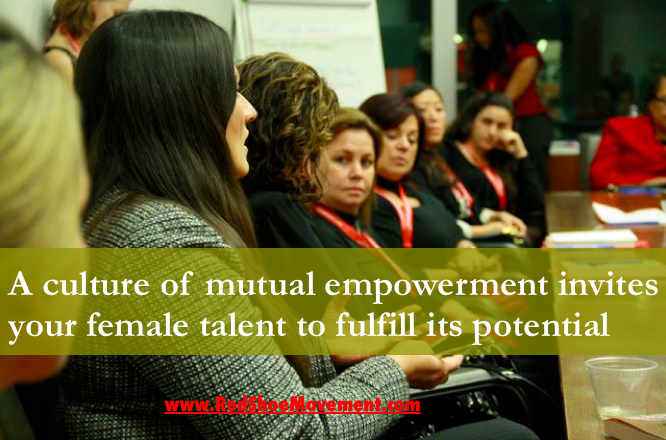 At the Red Shoe Movement, we don’t call our programs women empowerment workshops, because everything we do is based on mutual empowerment. We believe everyone has the ability to teach and learn at all stages of their lives and careers. Practicing this principle makes everyone feel powerful and it helps develop good leadership qualities. The acknowledgement that age, years of experience, or background are not factors that determine how much you have to offer is a great self-esteem boost for your female employees. Knowing that at 25 you have as much to teach as someone in her forties who’s had a very successful career pushes you to raise your hand for stretch assignments. Conversely, knowing that at 49 you can learn new things from your twenty-something-year-old colleague (and not just be her mentor) can give a new jolt to your career. We believe that knowledge is always in the room. That’s the reason we developed a methodology that favors a two-way empowerment approach rather than the more traditional approach supported by most women empowerment workshops. It allows us to tap into people’s internal motivations and interest, which is the only way to sustain their career engagement in the long run. Because when you depend on external experts to provide motivation, participants’ initial high level of enthusiasm wears off over time. Until they receive another injection of short-lived excitement from another series of women empowerment workshops. Do women empowerment workshops work? Only when you promote mutual empowerment. To drive engagement and productivity, nothing can compare to your employees sitting in the driver’s seat of their careers. Identifying where their passions and interests reside and matching them with their skills, knowledge and experience is a necessary step to establish career goals that each individual team member will be able to fulfill. This is not a process that can be achieved by a sprinkle of women empowerment workshops here and there. To that effect, our approach focuses on training your trainers to conduct sustainable, ongoing programs that you can measure. The RSM Circles invite small groups of women to meet every two weeks for nine structured sessions during which they work together to help each other figure out their individual career goals, they build camaraderie and trust which are the backbones of mutual long-term support. In the end, you’ll have a group of highly engaged women ready to tackle their next career challenge. So the next time you need to offer corporate leadership development programs for the women in your organization, think twice about the sustainability of the effort. Ask yourself, “What is women empowerment?” Am I really empowering women when I send the message that the power lives elsewhere and not within themselves? Are there ways in which we can create a culture of mutual empowerment rather than continue to act as though power is unidirectional? Once you answer those questions you’ll realize you might need to start making some changes in the kind of programs you offer and develop. And leave us your opinion of women empowerment workshops below! https://redshoemovement.com/wp-content/uploads/2014/07/Screen-shot-Women-Workshop-1.png 440 666 Mariela Dabbah https://redshoemovement.com/wp-content/uploads/2017/02/RSM-logo-website.png Mariela Dabbah2014-07-29 17:41:332015-12-02 03:42:27Do women empowerment workshops work?